Have you ever participated in a name challenge? If not, don’t worry. The rules are simple! Spell out your full name (first and last). Identify the workouts below that correspond with each letter in your name. e.g., Lady Gaga would do a 20 Squats, 20 Situps, 15 Burpees, and a 90 Second Wall Sit followed by 15 Squats, 20 Situps, 15 MORE Squats, and 20 MORE Situps. You go, Gaga! 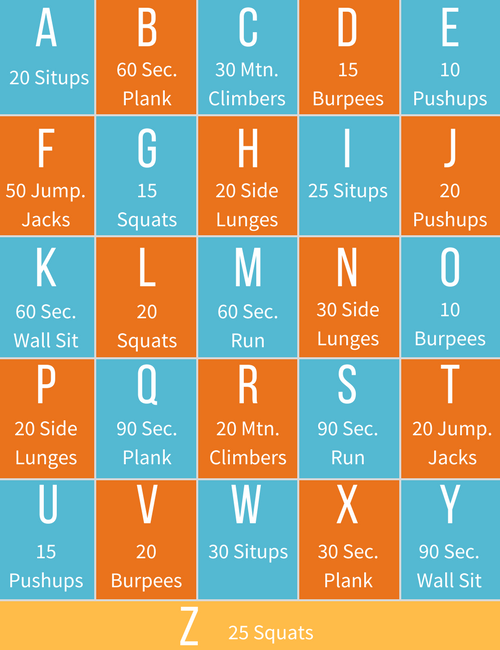 Complete a workout following the letters in your full name, then tell us where you started to feel the burn in a comment on Instagram. Here’s to hoping your parents blessed you with a short name. Ready … go! We hope you’re feelin’ the burn!